Carlene and Greg each participated in the activities and services of three Zion churches. We’ve posted pictures and video clips that can be viewed on our website. To view these click on the title next to our picture. From there you can check out our updated pages: PRAYER REQUESTS, HAPPENINGS, PHOTO ALBUM, and OUR MINISTRY. Destroy this temple, and in three days …I will raise it up. What’s GOOD about Today? Today Greg traveled five hours to share about the Zion Bible Schools with Pastors from the Christian Catholic Apostolic Church in Zion (pictured above). 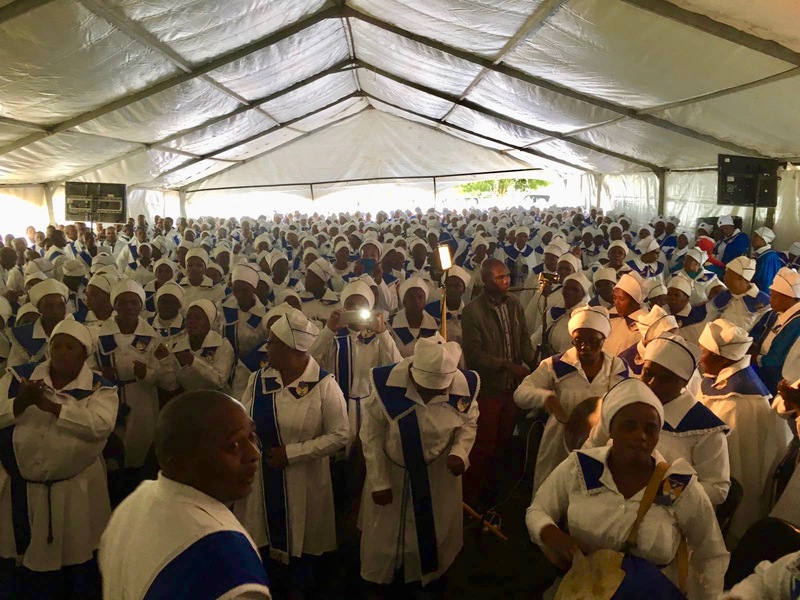 This is the first time we’ve had this opportunity to share about ZEBS with this denomination and feel like it is a significant step! We are excited that all of their pastors are encouraged by their leadership from the CCAC in Zion, IL to attend a Bible school with ZEMA. Greg traveled 5 hours this morning to meet with their assistant to the General overseer and help to clarify and translate for some of their meetings. But even more importantly, today is the day we commemorate Jesus’ death. Is that good? Absolutely! We chose the road to destruction, and He took the punishment in our place. Then He overcame that judgment in life, and instead of destruction we have the privilege of being temples and joining with our God through His Spirit. Enjoy your celebrations this blessed weekend! Today is Maundy Thursday. Does that mean anything to you? It didn’t to me. What I do know is that today Zionists are traveling all over South Africa to get to their services which begin tomorrow. And for our ministry, this is the busiest weekend of the year. 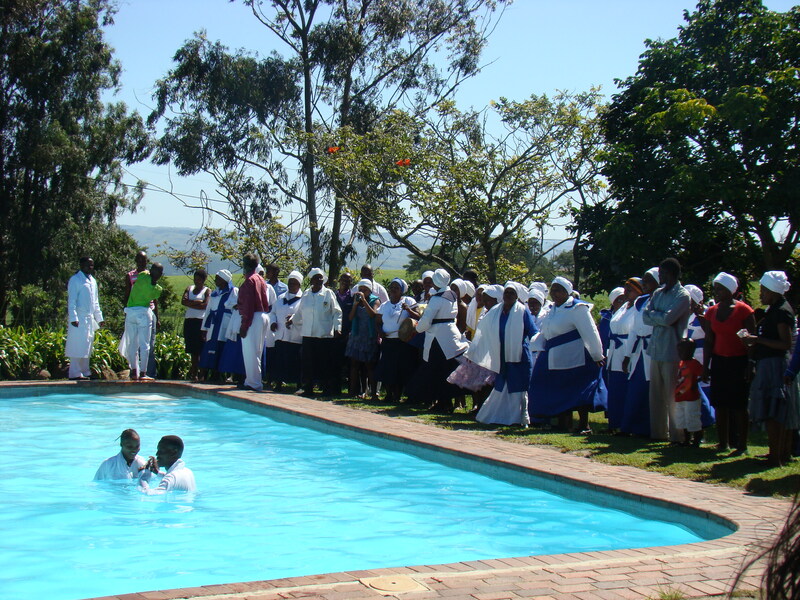 Carlene will host the Easter camp for Umfundisi Shobede’s Church, which comes to Sunbury each year (Baptism above, 2012). Greg will be traveling to various services from the Eastern Cape to Empangeni, which is just north of here. So, evidently, Maundy comes from the Latin root, “mandatum,” which means command. In the context of Easter, it refers to Jesus’ commands. “A new commandment,” He said. You know it well. Love …as He loved. How? Listen to others, live with others, connect. Give, and forgive, as He did. “Father, forgive them, for they don’t know what they’re doing.” That’s grace; His grace. Forgiveness offered, even before the offense is realized. Because “they don’t know….” We think we know, and say we know. But Jesus’ perspective says, we don’t. Forgiveness. A graceful offer to identify, and connect in the most difficult of circumstances. And this is the love He asks us to pass on. Then? All will know. He will multiply, and build His Church. Today, and every day, that is our goal and our prayer …for you, for the Zionists, and for ourselves.